After the fun days of summer are gone, it’s your time to take care of your swimming pool installation. Since the off-season is here, Land-con being one of the leading constructors of pool in Toronto, is here with a few tips for off-season swimming pool maintenance and care. These tips can help you have a clean and successful opening next year. Prevent your swimming pool construction to form algae with algaestat or algaecide. This stays in the water for a good amount of time. When you decide to close the pool, add the algaecide to the water and let the pump run through 24 hours. Keep the water circulation and pump closed in the off-season. The algaecide will keep the algae away, making your swimming pool installation easy to open for the on-season. Check your motorized components and pipes when you finally close your pool. The water stuck in the pipes and pump can freeze with the freezing temperature and damage the system through cracks. Cracks can cost you a substantial amount of money in the long haul. Drain out the water completely from the pool heater, filter and pump. Try to drain about 4 to 6 inches of water level from below the skimmer of the swimming pool construction. If you are wondering what to use to remove water from the pool equipment, sump pump or a pool vacuum is the solution. It can help you to remove the remaining water from the equipment. Winter covers are a must for your swimming pool installation. They not only save your swimming pool construction and the water inside in but also act as a security for keeping your pets and kids away and safe from the pool. When you have put on the pool cover, try to maintain the water level till the time it is on. In the fall season, add chlorine that can suffice through the whole winter. But be cautious while adding the chlorine. Adding more than the required amount of chlorine may bleach your pool liner. In the spring, as the water thaws, open a side of the cover and add chlorine into the pool water. This is the most crucial step. When you open your pool again, vacuum out the debris from the base of your swimming pool construction. If in spring, your pool shows the sign of green water, add more chlorine and let the pump clear everything out for you. If you do not see any progress after many hours, try to add repeated doses of chlorine along with algaecide and let you pool have an extra pool vacuum session. Maintaining clean water till you reach spring, makes your opening really easy. One major consideration of achieving this is to install a properly fitted pool safety cover. Loose pool safety cover can invite debris, specks of dirt and insects into your swimming pool construction. Many people live in an area where they face heavy rainfall during the fall, use mesh cover to cover their swimming pool installation. Due to this, the winterizing chemicals can be diluted because of the rainwater inside the pool. To make your pool ready while living in an area with such weather, add more chemicals while looking for algae blooms in the bottom of the swimming pool construction before you feel that the temperature is freezing. Artificial contaminations are bound to get in your swimming pool installation. Use enzyme product, that can be poured through the mesh cover as well, to help break these contaminations down. Prevent your swimming pool from forming a water line ring that develops in winter. Removing these rings typically involves scrubbing off the pool surface which requires a substantial amount of time, thereby causing a delay in your pool opening to late spring or summer. The above ground pools can accumulate many junks like sticks, leaves and more. This can develop a dirty stew in your pool as the water is stagnant. This can become a huge headache as they are difficult to remove completely from the pool. One can use an air pillow to protect your pool from this. 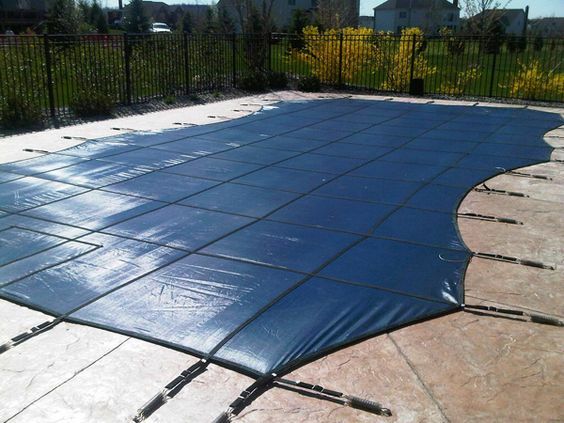 An air pillow is connected to your swimming pool cover and protects the swimming pool installation from ice and snow damage while keeping the cover intact and stabilized in the wind. Regularly check for loose ends of the above ground winter covers and tighten it if you find one. A loose cover can slip inside the pool. Keep your cables tight to avoid this. Also, check your air pillow for the air pressure inside it. If you feel that the air pillow is going flat, get another one immediately and set it under your swimming pool cover. There are many winterizing products available in the market that helps to prevent the growth of micro-organisms in the water. Such products keep your water clean for the spring opening. Also, try maintaining a required pH level of your swimming pool water to take care of your pool. Try to open the pool before the water gets warm. Warm water can form more algae so try opening your swimming pool installation in the early spring. Check-off the Swimming Pool Maintenance Checklist by Hiring a Professional! These tips are carefully prepared after our years of experience. With over 20 years of experience of being the industry credited Toronto pool builders and maintenance company, Land-con, can assure a professional winter closing for your swimming pool installation. We feel that we know what is right for your swimming pool. Give us a call on 416.504.5263 or drop us a mail on info@landcon.ca for an instant quote on our swimming pool maintenance service. Get in touch with us now and get a free expert consultation!